MP4 or AVI? Which is better? what are the differences? I want to convert a .mkv file into one of these formats. Which one provides the best video/audio? Would you go for MP4 or AVI? Once troubled, go for Google. Well, typing the words "MP4 VS AVI" on Google, you will get thousands of search results, among which how many answers actually benefit you. If you find the very answer you're looking for, then congratulations! But provided the fragmentary replies don't give you clear orientation, then here I will aid you to figure out the differences between MP4 and AVI and on earth which one is better for you. MP4 is the official filename extension for MPEG-4 Part 14 in essence. And MPEG-4 Part 14 is a standard specified as a part of MPEG-4, which is a method of defining compression of audio and visual digital data and introduced by the Moving Picture Experts Group (MPEG) in late 1998. MP4 is a multimedia container format most commonly applied to store digital video and audio streams, especially those defined by MPEG, but also used to reserve other data such as subtitles and still images. AVI (Audio Video Interleave) is also a multimedia container format as part of its Video for Windows tech introduced by Microsoft in 1992 in reprisal for the MOV file format, developed by Apple computers. AVI files can contain both audio and video data in a file container able to support synchronous audio-with-video playback. MP4 can be used for compression of AV data for web, applied for streaming media, for CD distribution, for voice broadcast television applications, as well as be streamed over the internet. Codecs: One big difference between MP4 and AVI is that AVI won't support HEVC/H.265 or VP9 formats. HEVC and VP9 are two UHD video codecs. With the support for both codecs, MP4 can hold 4K Ultra HD videos while AVI is only for HD and Full HD files. Subtitles: Subtitles also differ in MP4 vs AVI battle. MP4 natively supports two subtitle types, namley MPEG-4 Timed Text and VobSub. AVI can't hold subtitles it self, but it can contain SubRip, SubStation Alpha and XSUB via third-party modeification and DivX. Both MP4 and AVI are container files basically wrappers for formatted video files. The main difference comes not from the formats itself, but from the types of codecs used within the files. Each video file will differ purely on the basis of which codec is used. Hence, no matter two MP4 files or two AVI files can either be similar if they are utilizing the same codec, or they can be categorically different, if they are using different codecs. Compare MP4 with AVI, and we find out their differences in multiple aspects, but meanwhile we also see something in common. Quality: Though encoded and decoded by different codecs, alongside a form of lossy compression that loses some of the video data when the file is compressed, both MP4 and AVI can maintain the best possible quality compared with other video files. No wonder both are regarded as the most commonly used container formats that almost anyone who has preferred high quality video has made contact with these two container file formats at some point. Size: Owing to minimal compression features to ensure the highest possible quality, the two video formats are apt to correspondingly larger in size than other video formats like FLV and WMV. Yet, their file size doesn't cause any bother when transferring them to your portable devices. So if choosing the file format with optimal quality and proper size, MP4 and AVI are definitely the top on your priority list. Compatibility: As the above list shows, the two file formats have wild compatibility with media players and mobile devices. They can be played on a helluva lot of smartphones, game consoles and kept in storage devices for eternal save. Hence, for watching video on the portable device with sharp yet crisp image, what else is better than MP4 and AVI? Or, if you don't want to bother with the codec stuff, there is an easier way with a suitable video converter. For this purpose, Handbrake is a good choice, but I use a better one - MacX Video Converter Pro. Compared to Handbrake, this converter is more stable and also faster. You can convert AVI to MP4, transcode AVI, MP4 from/to any other formats, compress large AVI or 4K UHD MP4 videos into smaller sizes etc. with just one click. 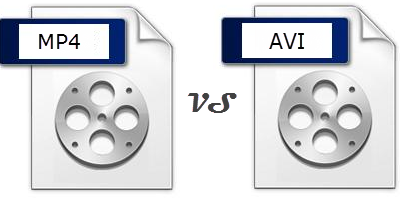 Through brief comparison between MP4 and AVI, I wish you have more clear understanding about the two container formats. They all have their pros and cons. And it's mentionable that in general MP4 is the prime choice as MP4 is friendly with almost all the mobile devices, and the H.264 video codec frequently used with the MP4 container is thought to be one of the highest-quality video standards available. Which one on earth fits your bill relying upon your specific demand. H.264 VS MPEG4, confused between H.264 and MPEG4? Don't worry, this tutorial will explain the difference between H.264 video and MPEG4 video. Your AVI to MP4 converter works slowly on Mac or the image looks blurry on Mac after AVI to MP4 converting? Hold on, here the top 5 list of best AVI to MP4 converters is compiled to tackle the issues. How to compress mp4 files on Mac? Which one is the best MP4 compressor for Mac? Answers are here. This article will tell you the top MP4 compressor for Mac to reduce MP4 to smaller size with zero quality loss. MacX Video Converter Pro is a feature-rich video converter to free download MP4 AVI video and compress MP4 AVI video to iPhone 6s/Plus, iPad, Android and more devices.